I am fascinated by the art of filmmaking. When I watch a film, I pay attention to camera angles, color and saturation, cuts and fades, how it uses music and lighting to evoke moods. I also listen closely to the dialogue and watch how the characters move from scene to scene. At the Bentonville Film Festival, I was in film-nerd heaven. 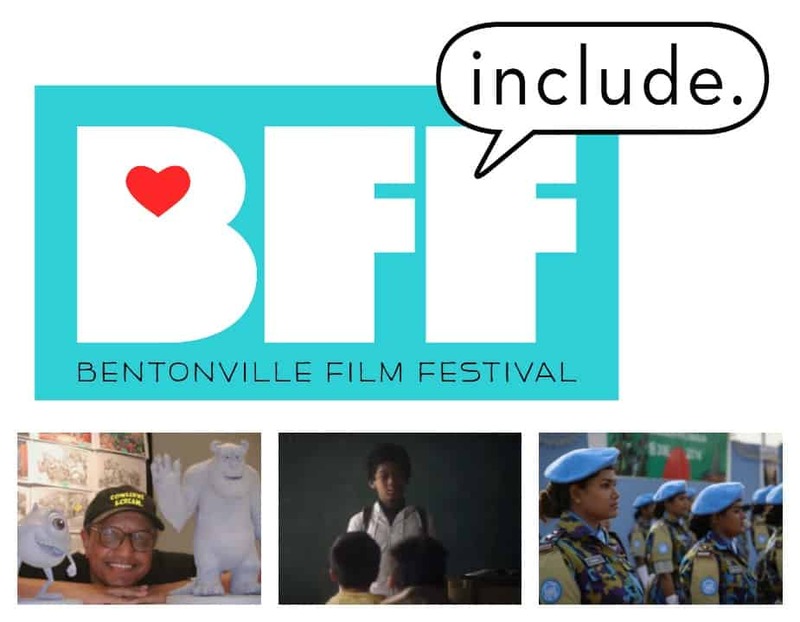 Co-founded by Academy Award Winner Geena Davis and President and CEO of ARC Entertainment, Trevor Drinkwater, The Bentonville Film Festival (BFF) is a commercial platform with a mission to champion women and diverse voices in media. According to the 2015 Hollywood Diversity Report, minorities wrote just 8% of films in 2014, down from 11.8% in 2013. The Geena Davis Institute on Gender in Media discovered that 31% of speaking characters in top-grossing films are female, and 13% of leading characters are people of color. The institute also reports only 7% of film directors are female. 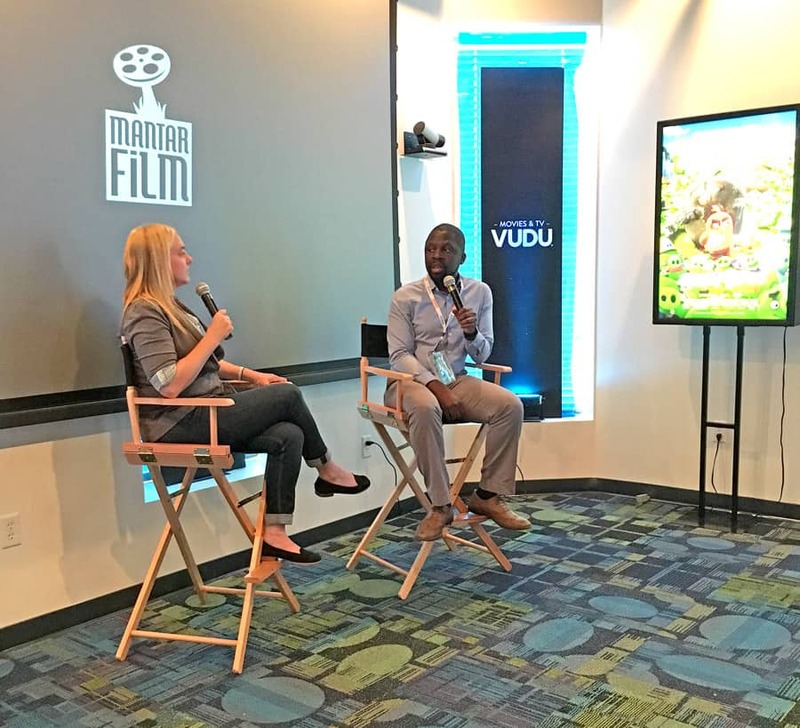 The Bentonville Film Festival festival intends to be a catalyst for change. The festival officially started on May 3rd, but didn’t arrive until May 4th. During the time I was there, I watched great films; listened to live music; met several actors, directors, and producers; and learned a lot about the entertainment business from industry professionals. I landed in Bentonville, AR, around 4pm and was met by my driver at the airport. As we drove to town, I was impressed by the natural beauty of Bentonville. Set amidst rolling hills and lush landscapes, Bentonville is a progressive community that has been branding itself as an arts and cultural center. The driver told me that the nighttime population of Bentonville is around 40,000, but it balloons to over 100,000 during the day because of Wal-Mart’s presence. After a pleasant ride to my hotel, I quickly dropped off my luggage and headed to the film festival. The majority of the events were held at Bentonville’s hip and luxurious 21c Museum and Hotel. Located on the northeast corner of the Bentonville town square, 21c is a 104-room boutique hotel, contemporary art museum, cultural civic center, and home to The Hive restaurant and the iconic Green Penguins. 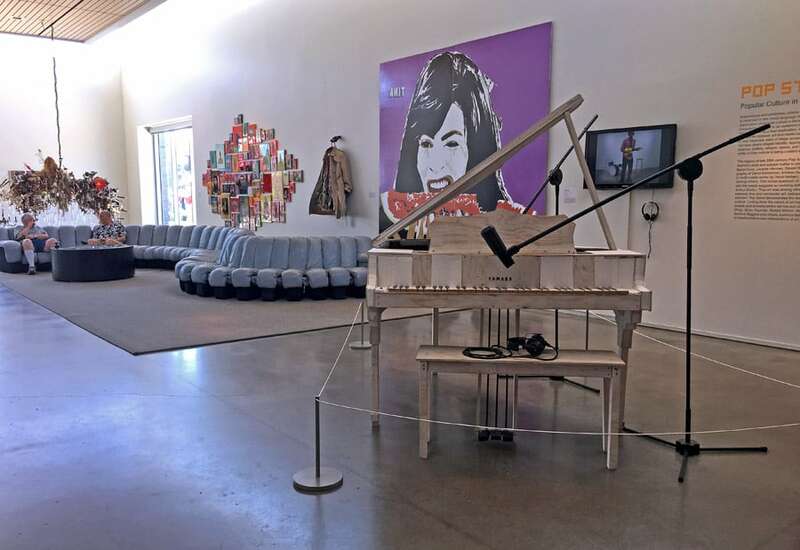 The museum was hosting an exhibit titled Pop Star! that re-envisioned stars of stage, screen, and sport and offered insight into how desire shapes identity. As a fan of pop culture, I was enthralled by the photographs, sculptures, paintings, and collages. I had a few minutes to spare, so I hung around the lobby to see if I could spot any celebrities. Within a few minutes, I saw Geena Davis, Teyonah Parris, fellow Howard University graduate Wendy Raquel Robinson, and Tisha Campbell. While sitting there, I witnessed an interaction between Campbell and one of her fans. A guy asked Campbell if she would take a photo with him, and she obliged. After he snapped the picture, he said. “Um, my name is Tisha,” the actress replied. The guy was so embarrassed. He apologized profusely for confusing Campbell with her co-star. Campbell was gracious and laughed it off. A few minutes later, I left to attend my first event. As I was leaving, a woman stopped me. “Okay,” I said. “Thanks.” She shook my hand and implored me to keep spreading positive vibes. Wow! Celebrity sightings and a metaphysical reading all in one day. 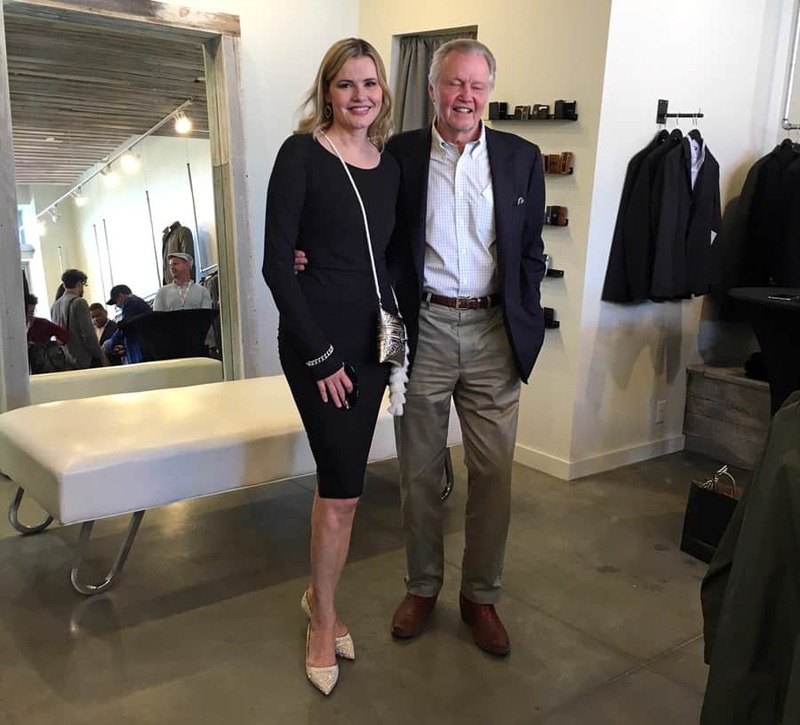 From there, I headed to a private Happy Hour event hosted by Geena Davis at The Independent, a local menswear shop. It was fun to sip champagne with Davis and other celebrities and filmmakers. I also chatted with several locals who were more than eager to tell me about Bentonville and what makes their town a great place to live. Based on the recommendation of a local, I grabbed some dinner at the Flying Fish, a seafood restaurant. I ordered the fried Catfish and Shrimp basket with a side of seafood gumbo. While I enjoyed the gumbo, which was smoky and flavorful, I was a bit disappointed by the catfish. As someone with deep Lousiana roots, I have high expectations for fried seafood. I should have taken the advice of another resident and ordered the fish tacos. While I was eating, Gil Birmingham (Twilight, Unbreakable Kimmy Schmidt) sat at the table across from me. A couple of rabid Twilight fans hovered around the table before building up the courage to ask for photos. Birmingham gladly interacted with the fans for a few minutes and returned to his meal. I’ll bet he ordered the fish tacos. Although there were many incredible films at the festival, the one I was most excited to see was Elektra Woman and Dyna Girl. I watched the original show on Saturday mornings when I was a child, and I was curious to see how the filmmakers would update it to appeal today’s audiences. The film stars YouTube personalities, Grace Helbig and Hannah Hart. 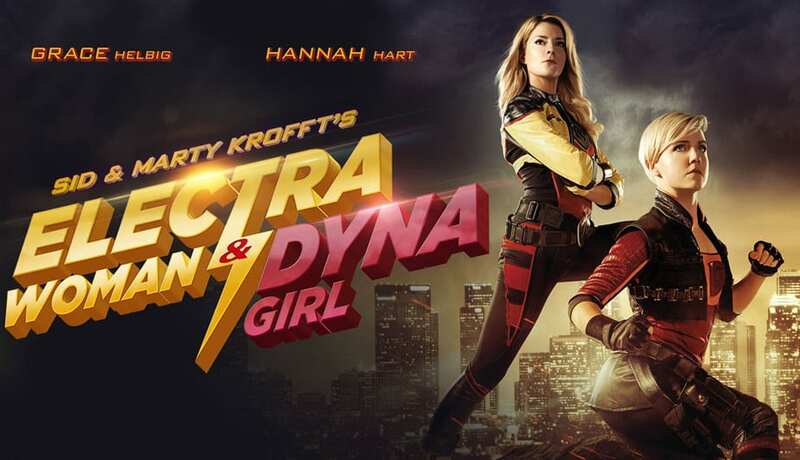 Electra Woman (Helbig) and Dyna Girl (Hart) are two amateur superheroes who fight crime in their local city of Akron, Ohio. Wanting to be noticed for their actions, they accept an offer to relocate to Los Angeles. Consequentially they find themselves overwhelmed in the crowded superhero business. I enjoyed this movie because it was funny, quirky, campy, and self-aware – a stark contrast to the current trend of dark, violent superhero movies. After the movie, I walked over to the Meteor Guitar Gallery to see Kris Allen in concert. On the way to the show, I was stopped by another woman. “Why aren’t you hanging out with all of the famous people?” She asked. “How do you know I’m not one of the famous people?” I asked. The woman stared at me for a few seconds trying to figure out if I were a celebrity. Satisfied that I wasn’t, she offered advice on where to eat while I was in town. “You should visit Tusk and Trotter,” she said. “Try the Pig Ear Nachos and Toasted Almond Brown Ale.” I thanked her for the recommendation and scurried around the corner to the concert venue. 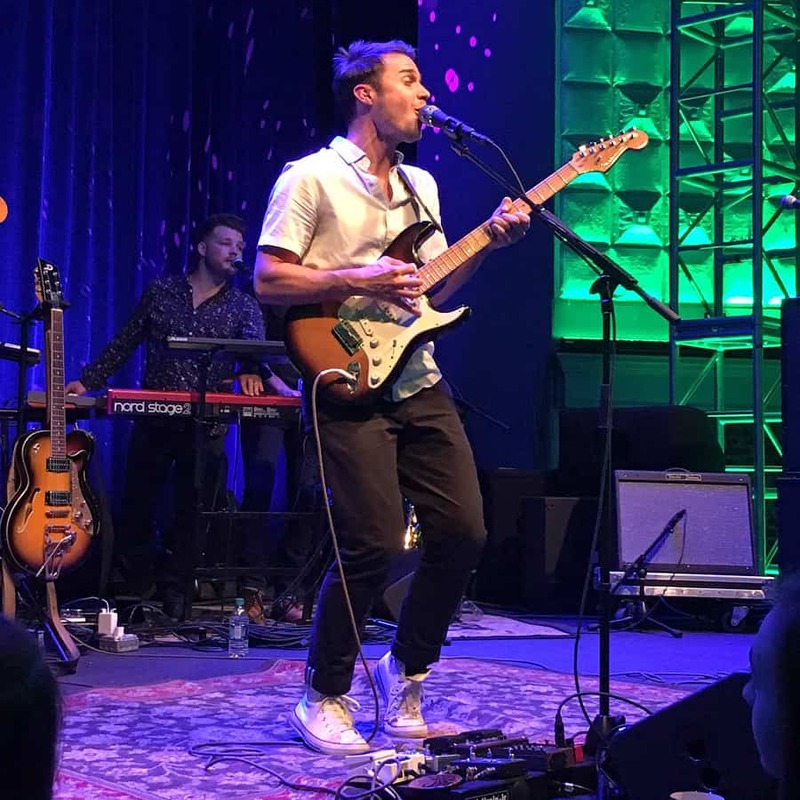 Kris Allen took the stage around 9pm and put on a great show. I became a fan of Allen after his rendition of “Billie Jean” on American Idol. At one point in the show, Kris stopped singing because the people in VIP section were too loud. “I’m trying to sing down here,” he said. “Can you please stop talking?” Everyone got quiet and Allen continued his song. If you keep doing nothing, then nothing will ever change. For the finale, Barrett Baber (The Voice Season 9) joined Allen on stage to perform “Purple Rain” in honor of Prince. I woke up early to cram in as much activity as I could. I headed straight to 21c to attend the first panel, “From the Director’s Chair,” where female directors shared their candid insights on their creative process and working styles. The panel included Meera Meon (Equity), Jennifer Yuh Nelson (Kung Fu Panda 3), Maggie Kiley (AFI Shorts) and Elisha Paloschi (Driving Selvi). Next, I went to the Tales from the Script panel. I was most eager to attend this panel for two reasons: #1) I’m a budding screenwriter. #2) I’m a fan of Aida Croal, who is currently writing for Marvel’s Luke Cage on Netflix. Croal shared a story about a poem she shared the poem with one of her elementary school teachers. The teacher was so impressed by the work that she published it in the school newsletter. When Croal saw the poem, she was mortified. Other panelists included Melissa Cobb (Producer, Kung Fu Panda 3), Shannon MacIntosh (Producer, Hateful Eight, Django Unchained), Wendy Calhoun (Writer, Empire). These talented women talked about the importance of creating diverse characters in the development process. To achieve this goal, Calhoun uses the “What If” process. After the panel ended, I left to meet some friends for lunch. Once again, a local resident stopped me. “I run a men’s lifestyle site called Mocha Man Style,” I said. “Oh, okay. I thought you were someone famous,” she said as she walked away. Later that afternoon, I spotted Croal outside of 21c and we spent about 30 minutes talking about writing, Ta-Nehisi Coates and Black Panther, and of course, Luke Cage. I bid her adieu and I headed to Crystal Bridges Museum of American Art to see “Geena and Friends.” Geena Davis and a group of talented women – Constance Wu (Fresh off the Boat), Nia Vardalos (My Big Fat Greek Wedding), Kathy Najimy (King of the Hill), and Gina Rodriguez (Jane the Virgin) – reimagined dialogue from all male movie scenes. This hilarious table read tackled Toy Story, The Avengers: Age Ultron (an NFL Running Back got the honor of playing Black Widow), and several other popular movies. I enjoyed the improvisation, humor, and camaraderie. Vardalos was especially entertaining because she kept forgetting to bleep out the profanity. Later that evening, I attended a Filmmakers Happy Hour at Ramo d’Olivo, a laid-back wine bar in Bentonville. Geena Davis stopped by to mingle, but I was most fascinated by Fanshen Cox DiGiovanni. 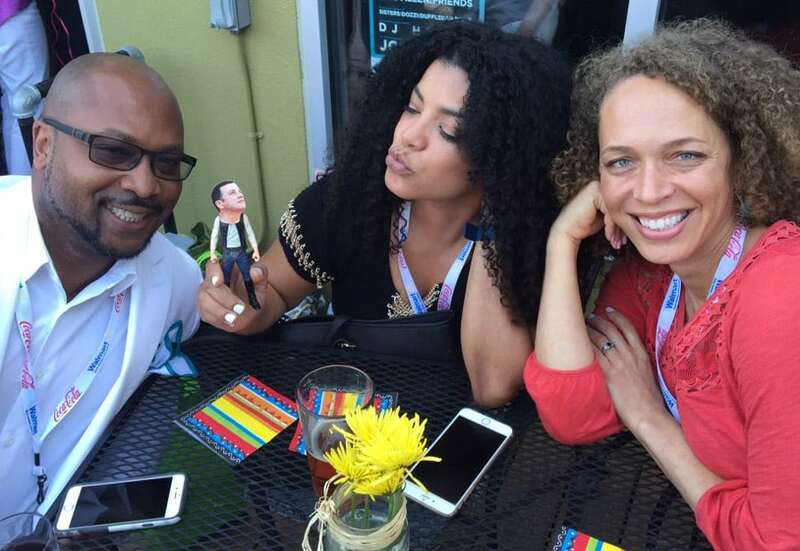 I met her while having a glass of wine with my friend, Daily, who writes the blog, DailyCurlz. Fanshen is the star of the multimedia one-woman show, One Drop of Love. The show explores the intersections of race, class and gender in search of justice and love. If you’re in New York on October 13th, be sure to go and see it. I grabbed dinner at the Press Room and enjoyed Jerk Pork Belly with a full-bodied stout. The meal was delicious. 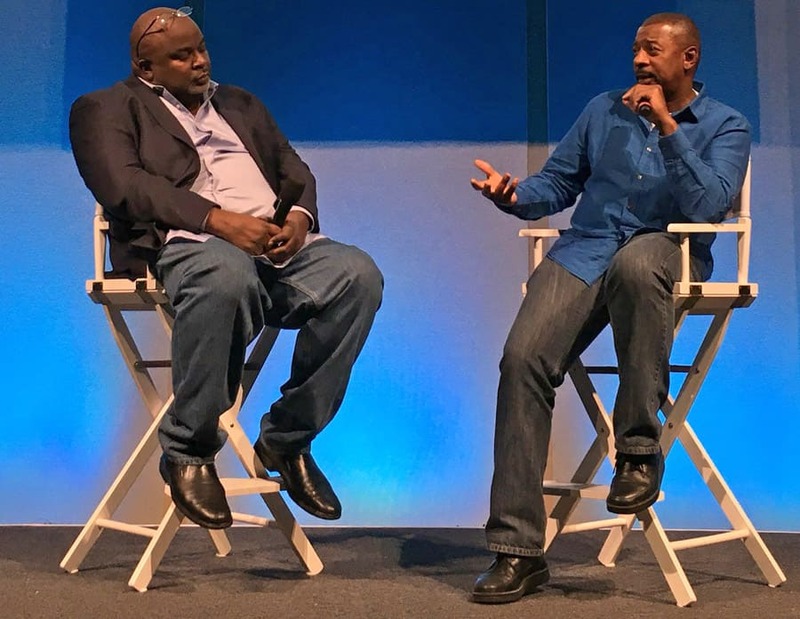 My final event of the evening was a Q&A with Robert Townsend. There was a 25th Anniversary screening of The Five Heartbeats (Townsend’s best film, and one I’ve seen at least a billion times) right before the Q&A. I arrived about 20 minutes before the film was over and noticed Townsend in the lobby. He was pacing back and forth and would periodically peek into the screening. It was interesting to observe how an established director such as Townsend still worries about how an audience will perceive his film. During the Q&A, I asked Townsend what he would do differently if he were shooting his first film, Hollywood Shuffle, today. 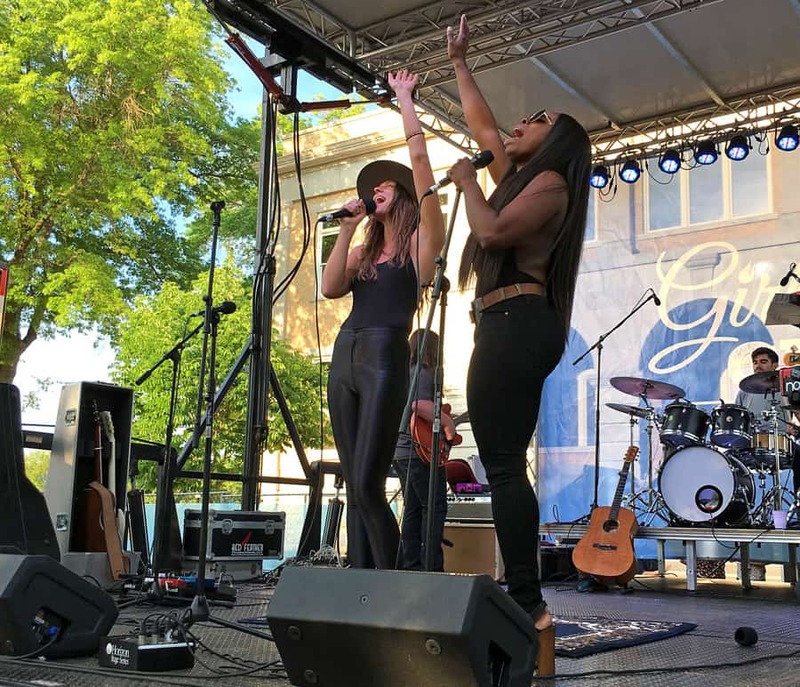 On the first Friday of every month, Bentonville Square is transformed into a themed community block party with live music, food, and family-friendly activities. I spent most of the day checking out the First Friday festivities and watching short films in the Vudu Lounge. On the way into the lounge, I met an elderly resident who was curious about it. “What is this place?” she asked one of the workers. “I don’t care what it is. I don’t want anything to do with voodoo,” she said as she made a mad dash to the exit. The worker and I looked at each other and started laughing. I guess you can’t be too careful when it comes to voodoo. The best film I saw in the lounge was Born With It by filmmaker, Emmanuel Osei-Kuffour. It is the story of a 9-year-old Ghanaian-Japanese boy, Keisuke. The film highlights the experience of mixed-race individuals and their families in Japan. Ose-Kuffour’s film won the NBC Shorts Contest. After the screening, I talked to Osei-Kuffour and discovered that he was also from Houston. The filmmaker now splits his time between Los Angeles and Japan as he works on a feature film that explores what it means to be a Christian in different parts of the world. After the concert, I joined some friends for dinner at Tusk and Trotter and remembered the woman’s advice to order the Toasted Almond Brown Ale and Pig Ear Nachos. “I’m just making sure because many people order this thinking that it’s regular nacho chips,” she said. 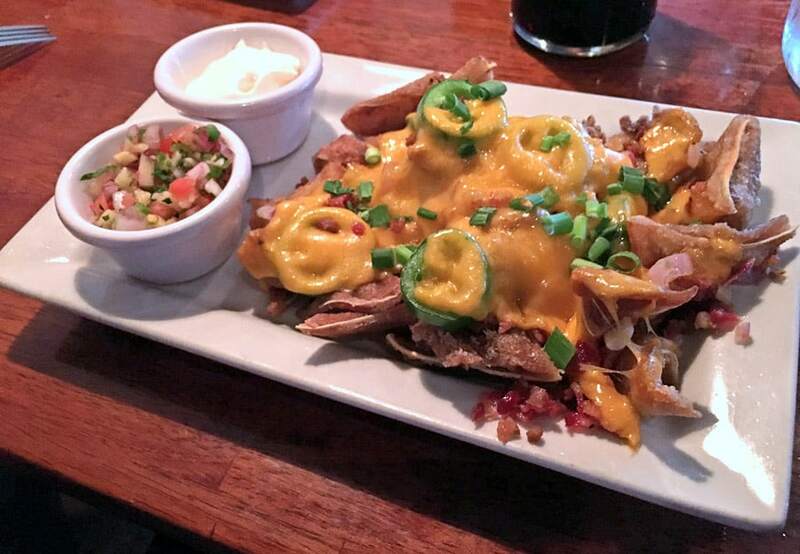 The nachos and beer were both tasty, but I especially liked my friends’ pork rinds and truffle fries. Later in the Filmmakers lounge, I chatted with the Raising Bertie filmmakers, the Tested director, and actors Catalina Rodriguez (Saved by Grace) and Joey Lawrence (Blossom, Melissa & Joey). Listening to their approach to filmmaking was interesting and educational. I ended the night at the Meteor Guitar Gallery for an acoustic set by Barrett Baber. 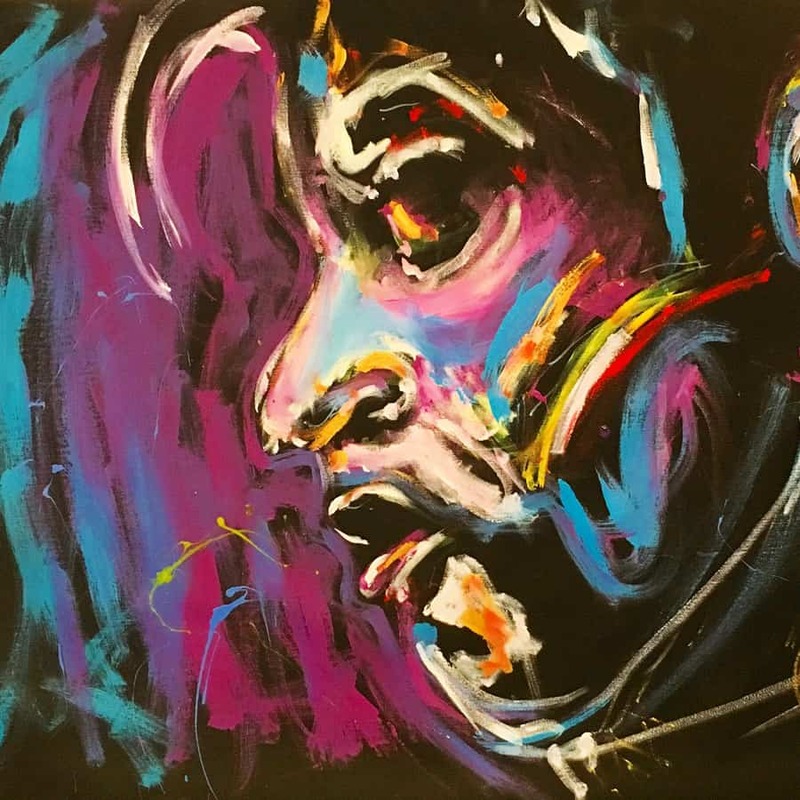 Before Baber took the stage, an artist honored Prince by painting a portrait while Prince’s music played in the background. After Baber’s set, DJ Henri really got the party started. She got the crowd hyped up and we danced nearly to the break of dawn. Films in the categories: Best Narrative, Best Family Film, and BFF Audience Award winners will get guaranteed distribution. Although I attended the bulk of the Bentonville Film Festival, there were so many events I didn’t get to attend (Free Comic Book Day with Aida Croal), films I didn’t get to watch (Maya Angelou: And Still I Rise), and concerts I didn’t get to see (Darius Rucker and Marcus Johnson). I guess I’ll have to try again next year.